Your employees are done covering their shifts and you want to confirm everything or simply see how many hours someone worked during a certain time period? 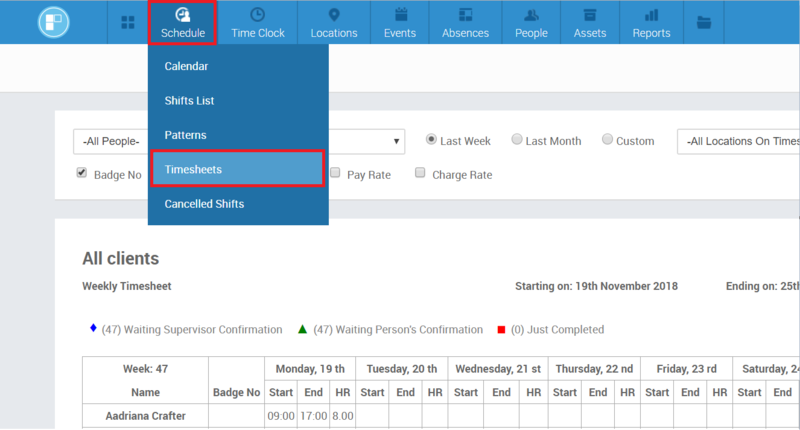 There are two pages where you can approve timesheets - Time Clock page and Timesheets table which allows to filter timesheets by Client. 1. Go to the Time Clock page by clicking on the tab on the top blue menu bar. 2. Use filters to find specific timesheets - select time period, person, location and position. Next, you can check the Start and End times and amend them by clicking on the time boxes. Please note! If the actual Start and End times differ from the scheduled Shift times they will be shown as red to bring your attention to it. 3. To approve a timesheet click on the green 'Approve' button. 4. The timesheets from the Time Clock page will show on the Timesheet Summary report. This is the report which shows the actual shift hours which come from clocking. Hover over the Schedule tab and choose Timesheets. This will take you to your worksheets page. To filter out a specific employee or client, just choose a staff member or client from the drop down menu. Now your page should display only worksheets connected to that specific staff member or client. You can also select the time period you wish to view timesheets for. To do this, select either "Last Week", "Last Month" or "Custom" - the "Custom" option allows you to choose your own start and end times for the period you wish to display. Below the filters you have a Badge No, Position Short Code, Pay Rate and Charge Rate you can choose to be included within the worksheet. By ticking all or any of those options the results of those choices will be displayed within the worksheet. You can see total hours in the right hand side of each worksheet. On the right hand side of each weekly worksheet, there are also Confirm buttons - if you're viewing all people there is one on each employee's row so you can approve them separately or just click on the green tick icon in the bottom right corner to approve all worksheets for all staff members for this week. Now you know where you can find and how you can confirm worksheets!